Everyone remembers the cantina from Star Wars. It was one of the most popular scenes from the original film because it featured a scene familiar to movie-goers: a gathering of diverse peoples huddled in one place for the purpose of drinking, making shady deals, and catching the latest live entertainment. Obi-Wan Kenobi said to Luke Skywalker, "This place can be a little rough," and within a couple minutes Kenobi himself cuts off a cantina patron's arm. Rough indeed should that crazy old wizard show up. Hopefully things don't get that violent when we show up at the non-fictional Cantina as part of Galaxy's Edge in 2019. The fictional cantina made us feel at home in a weird way. It's a dark dive with a bristly bartender surrounded by wasted patrons, some of them regulars, a couple people arguing on one side while a card game takes place on another. Then there are some creatures smoking on a hooka (or chewing on a screwdriver, maybe some drinking screwdrivers) who just want to listen to the band. In an uncomfortable moment the bartender shoos away Luke's droids saying, "We don't serve their kind here." We've seen that on Earth, too—the exclusion of certain citizens from fear or hatred, racism, whatever it is, in spite of their innocence. That gets a bit real to us for a moment. The droids, 3PO and R2 quietly leave, while those who are allowed into the joint start fights, brandish laser swords, and shoot first without asking questions later (although they pay for any mess they make). It ends when the law enforcement, the Stormtroopers, show up after the violence and can't do anything because they didn't see it. It's a lot of action to take in within a short time but it really showed the audience that this galaxy is a bit like ours and has just as big of a seedy underbelly as our own cities have. In the coming park, it will perhaps have the feeling of a place of "scum and villainy," but without any real danger. When it came to designing Galaxy's Edge, including a cantina was a foregone conclusion. I talked about the possible food and drink in such a place last month. We hoped there would be a cantina and our speculation was relieved when the first images of the park's conceptual drawings came to light and indeed a cantina was present. It is finally good to get some, albeit few, details about the cantina that we can one day visit and depart from alive. Disney blogged a few bits of information about it and we're getting a taste of what the experience will be like. The description in Disney's blog cannot tell us how the atmosphere will actually feel; will it be dank and dusty? Will it feel welcoming or threatening? Just how many costumed character aliens will be hanging around? Can we jump in on that game of Sabacc in the corner booth with Hammerhead? Will it be just a re-themed Cosmic Ray's café? I'm always worried about waiting in lines so will there be reservations like Be Our Guest? Seems to me it would be hard to keep the theme and immersion happening when I'm in line with all these folks from that darn Milky Way galaxy. The cantina here has a name, Oga's, named after its owner and operator (and bartender?). Oga Garra is the establishment's, "intriguing alien proprietor." It's a good simple and easy-to-pronounce name—maybe too simple a name in the Star Wars realm? Let's just keep it simple regardless. She runs the place much like Maz Kanata runs her "watering hole" on Takodana. With Oga's name in the title, it gives her cantina a personality where she "tries to keep its unruly patrons in check." She sounds like a tough character—guests won't mess with her. To run a place like this you'd have to be resilient so I believe her name will invoke an aura about it which will give the costumed character some substance. When this cantina was first announced last month, most of the headlines that followed on the web tended to focus on the presence of alcohol. "Disneyland will finally serve booze!" read most of the clickbait. It makes it read like some old timey forgotten pastoral way of life is crumbling away because of this god-forsaken Star Wars thing coming in and messing up Walt's vision. Psshhaw! The blog post said there would be, "libations for adults," and that seemed to shake the web and made columnists drum up something shocking for readers, inducing visions of First Order pilots dropping parachuted crates of Bud over Black Spire Outpost. Alcohol is not the point. The point is the theme. With the Star Wars theme in place, we will be able to peruse an otherwordly menu that could challenge us to try new things and see what, by word of mouth, gets to become the thing to order at Oga's Cantina. "Have you tried the pink and green soda, it's appealing, don't believe me? Ask the twi'lek!" (Intentionally terrible slant rhyme…) Scott Trowbridge (Portfolio Creative Executive, Walt Disney Imagineering) replied to a comment on the blog post that the drinks (non-alcohol- and alcohol-based) will be "creatively-themed." Not just themed, mind you, but creatively themed. Even he was trying to get across the point that it isn’t about the liquor, it’s about the immersive experience. Such drinks will get people talking, not sloshing, especially considering the drinks won't come in cheap six-packs. It's simply intended to be fun. So, what's the cantina without a little music? We recognize that silly tune from the original movie and that Bith Band is as ubiquitous to the film's cantina as its other alien patrons. George Lucas discussed that music with composer John Williams asking him to "imagine several creatures in a future century finding some 30s Benny Goodman swing band music in a time capsule or under a rock someplace… how they might attempt to interpret it." Lucas wanted to be sure the place was familiar and alien at the same time. Adding live music was a great touch. Are we going to see such a band play live at Oga's? Even if it's animatronics? Well, we're not sure yet but Disney's blog post mentions that there is a director of entertainment at the place. That director is none other than RX-24, "Rex," the original pilot from the first version of the Star Tours attraction. No doubt he was probably fired from his job since he could never get guests to Endor on the ride. Due to this track record, I expect things for our beloved host not to go as planned at the Cantina either. It will be nice to see a little Disney contribution to the Star Wars world be repurposed for the theme park. Most fans are already asking if Paul Reubens will again provide the droid's voice and mannerisms. No official word on that so time will tell. I'd welcome that, certainly, not just to preserve some continuity (if that's even a thing here) but because he's funny and him as a DJ in a Star Wars bar would be hilarious. Here's hoping that does happen. At the very least, Rex will spin that original cantina tune more than once a day I'm sure. Speaking of music, there is a rumor that John Williams himself may "score" Galaxy's Edge. The rumor also includes Michael Giacchino as a contributor as well. Giacchino scored Rogue One and the current Star Tours attraction. If these rumors are true then consider me happy as an Ewok in a tree with a blaster. Music from all the Disney parks is something of an obsession with me. I love listening to the music while just walking down Main Street USA or finding my way through Animal Kingdom. That music adds so much to your emotion and to the theme of the park itself. I couldn't imagine anyone better for the job of adding music to Galaxy's Edge than John Williams and Michael Giacchino. It might even be a welcome challenge to them to create music that not only would enhance the story of the Millennium Falcon and escape-the-First-Order (can we get a name for these yet, Disney?) attractions, but also set the mood for the different areas of Black Spire. There would be music at the entrance to make you feel the beginning of a great new journey. Then music would keep you moving down the streets and that feeling of taking it all in. The shops and corners would have music to just make you feel the wonder of the place, make you want to explore and discover new things. Disney Park CDs along with Star Wars CDs in my collection. A Galaxy's Edge park CD would be a welcome addition. Photo by Todd King. Music plays such an important role in the parks for enhancing the theme but psychologically it can help keep the peace and aid in crowd control. The music from the parks, more than anything else for me, is what always brings me back to the parks in my daydreams. It is why I try to grab as many of the park exclusive CDs I can get. Since I can't visit the parks everyday (I envy those who can), I can pop in one of the park CDs and it transports my mind's eye to the Magic Kingdom, to Epcot, and to the rides instantly. The orchestrations of John Williams is already some of the most iconic pieces in modern music and if he were to bring his genius to Galaxy's Edge, it would be nothing short of miraculous. George Lucas said that sound and music was half of the cinematic experience. The score by Williams elevated everything about Star Wars and now, his involvement in the park, should it happen, would have an equally profound effect. With all the work the imagineers are doing on the park, I'm certain that the ride soundtracks and the ambient music are not being overlooked and it will be a great part of the experience no matter who Disney finds qualified to create it. But if it is John Williams, then we will truly be in for an abundance of enchantment. 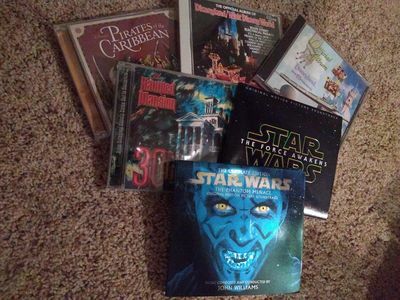 And if they make any CDs of Galaxy's Edge music, it will be the first thing I buy there, even before any adult libations. It's a different cantina, on a different planet, with a different history. Why would you expect to see the same visitors to a cantina on Batuu as you saw in a cantina on Tatooine? And the story on Black Spire Outpost is some, what, 30+ years in the future from the events at the cantina on Tatooine? I've seen so many people say they hope the band and the iconic song is featured prominently in the new cantina, and I honestly can't understand that at all. It just seems lazy to me. This is a cantina with a different story. Let the new story play out. I'm ok with an "R2 and 3PO in the Well of Souls room in Raiders" kind of cameo, but that would be it. To me they already have a good model for this: The Hanger bar at Disney Springs. Set in the Indiana Jones-verse, with memorabilia, an interesting drink menu and some light food options. If it's going to be in the park as an attraction, then treat it as such. The one thing that I hope does not happen is that it becomes a full service restaurant that nobody can get into spontaneously (think just about every restaurant at Epcot). If this thing has ADR involved, it's a failure in my book. It's hard to get excited about this for one simple reason--virtually no one will experience anything like meandering through a shady cantina full of alien beings. If it has a bar feeling--and the artwork suggests it will try to--how many people will be able to sit at the bar? The thousands who come through Galaxy's Edge every day? Not a chance. Hundreds of them? If even dozens can fit in any proximity to the main bar space, I'll eat my hat. Take the seating of Hungry Bear and spread it around a bar. Are you going to have an intimate encounter with aliens in that kind of throng of people? Now realize that there are probably 5 or 10 thousand people right outside the door who feel like they should get the same intimate, atmosphere-heavy experience you're having. If they give it a capacity even 10 times that of the Cove Bar, it still won't meet demand and, by simple physics, can never offer the type of encounter Disney is advertising and people are hoping for. At least it can't except for a very, very few. The Hangar bar sounds cool. I've seen people asking about ADR for the cantina, and I'm with you. I didn't get the impression that it was going to be a restaurant, but rather, a bar, with light appetizer-type food. It's hard to get excited about this for one simple reason--virtually no one will experience anything like meandering through a shady cantina full of alien beings. If it has a bar feeling--and the artwork suggests it will try to--how many people will be able to sit at the bar? The thousands who come through Galaxy's Edge every day? That's been my concern about the entire land. It's supposed to be a fully interactive experience, like you're actually in that location. If that location was real, I wouldn't expect it to be packed. I was there on opening day of Radiator Springs, and it was wall-to-wall people. I can't imagine that Black Spire Outpost will be any less popular. I've wondered about controlling entry into the land, but there's no mechanism for making people leave, and until people leave, more people can't be let in. Hoping they've already thought about how to handle all this. Very true. I wasn't thinking about the new setting, I was fanboying and just putting Star Wars and Cantina together and not going beyond the first film. It's that nostalgia thing that makes me hope for a nod or two to the original cantina--I think some fans might expect that. Whether they do that or not won't take away from the experience. You and cstephens are both right. I really don't know how they will handle this. For all the interactivity they're touting, how will that be possible with floods of people? As for the Cantina, I wonder if it would be something akin to Be Our Guest where the entrance is themed with authentic-looking decor and you enter an area to place your order (interactive screens), also themed with characters, and there you pick your food, seats, as well as your experience (there may only be a certain number of spots of those per day) like meet a pilot or bounty hunter, pay for it all, then finally enter the Cantina, get your table (or the bar if you chose it), then you're in the thing. I'm not sure if that would work here (Beast's ballroom is quite huge to accommodate the crowds). Maybe dinner would be a bigger experience, too. Maybe there will be two Cantina locations. Maybe they can "plus" this idea to handle the deluge of guests better--they certainly don't want this to be a negative experience. I agree, too, that there seems to be "no mechanism for making people leave" as cstephens said, and that's a problem they're hopefully thinking through, too. My optimistic view thinks they'll have it worked out. My pessimistic view thinks none of it will work right until crowds settle down--and how long for that? 2-3 years? There is no way they can do this fully interactive experience thing they claim. How are the characters going to be able to interact with everybody. What is the technology that is going to be able to keep track? I know the magic bands keep track of where you are in the park, but how is it actually going to work with a character pulling out his iPad and scanning me? Before the opening of Toy Story Land and Galaxy's edge, DHS would see on average 30,000 people a day. With half the park new you can easily expect that number to increase. You would need hundreds of inter-actors wandering around to engage with any significant number of people. Lets use 50 actors on stage at any given time, from the moment the park opens to the time it closes (on average 12 hours). At $15 per hour which is what Disney has agreed to start hourly employees at, you're looking at more than $3.3M annually just to have people walking around, talking to guests and providing atmosphere. Now if you're Disney you have to evaluate, what's actually the driver of the crowds? Obviously the answer is the chance to fly the Millennium Falcon and be in a battle onboard a star destroyer... it's not going to be the guy saying "You'll be in trouble with the bounty hunters for crashing the Falcon." So that number is going to drop, until it becomes just a handful, the same as it was with the Citizens of Hollywood. Now you're not being fully immersive and a good chunk of guests just aren't going to interact at all. I have no idea how to fairly distribute these FP+ though. Random? The above all assumes it is not fully a Table Service venue (or that there is some sort of combination - maybe table service, but can also have people wandering about? - that seems possibly problematic except for a few non-diners though - sort of how you can walk around in BoG, but you need to have been eating there with a reservation before you can do so). If it's full table service, it will just be a near impossible to get ADR that very few people will get to see. 2) Re the interactive stuff. The math above can't really be disputed, good points! I need to say I never considered that feature to be inclusive of all guests though. I would have considered it a random thing, sort of like being the Rebel Spy on Star Tours. Not every visitor gets that thrill either(or being "That Guy" at Monsters Inc. Laugh Floor, etc). I can easily see this ending up being heavily skewed towards guests staying at the SW Hotel once that is up and running though. With the price they will be charging, it's pretty much a guarantee (rightfully so for the money that will end up being spent) they will have to hit everyone staying there with some level of the interaction they are touting. I also don't see the roaming CMs actually dealing with iPads to scan guests. I suspect there would be backstage handlers dealing with the band scanning and then talking to the roaming characters. (If technically possible, I suspect not the kind of band reading where you need to touch it to an iPad or reader, but the type where you get a ride photo without having to scan your band at a screen or kiosk - like SDMT). The roaming CM can then just be told: "Hey the guy in the red shirt and blue shorts with a Yankees hat just crashed the Falcon" or "The lady in the gold Minnie Ears and white handbag just scored the best for the day", etc. I agree, too, that there seems to be "no mechanism for making people leave" as cstephens said, and that's a problem they're hopefully thinking through, too. At last year's D23 Expo where they had the giant model of Galaxy's Edge, they also had Imagineers around to answer questions, and I asked about how they'd get people to leave. He said he didn't think that would be an issue for most people, and it's honestly something I'd never considered. But in thinking about it further, while there are some of us who would be happy to spend all day there, most people will likely want to look around and then go on to do something else. I know I've been in other situations (other theme parks and such) where I've hung around one place for hours while most people just stay 5 minutes. He also mentioned that they're coming up with ways to encourage people to leave. I'm wondering if that's having to do with stormtroopers or bounty hunters and such. That might be hard to manage on a large scale, and then there's the issue if you're with a large group, how to get everyone to leave. Guess we'll see how that plays out. I know the magic bands keep track of where you are in the park, but how is it actually going to work with a character pulling out his iPad and scanning me? Magic bands would only be an issue at DHS, but it doesn't factor into Disneyland. I'm wondering how it's going to work. They've said that you establish a reputation there, that how you do in the Falcon attraction can affect how residents react to you. And not everyone is going to want to carry around a reputation. I was thinking they could do some kind of card that would identify you and your accomplishments and such. But then, I'm not sure that an ID card fits into the theme of a remote outpost, but maybe they could come up with something like that which would make sense thematically.